Treetop tours and massive mud pits are just two examples of the several exciting and challenging activities available during new teambuilding zip line tours and bonding events at Zip KC and the KC Timber Challenge. Located in nearby Bonner Springs, Zip KC is a one-of-a-kind Kansas City attraction. Nine zip lines and five towers surround the 143-acre adventure park, with the tallest tower—also the highest point in five counties—offering amazing Kansas River and urban skyline views. Kids can have more Zip KC action now, too, thanks to the addition of birthday party services with free T-shirts, discounts and access to picnic areas. 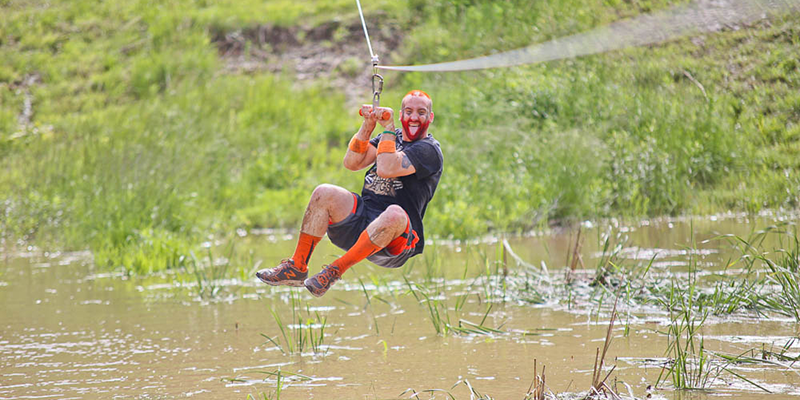 Meanwhile, woods, bluffs, rock walls and other challenging terrain characterize the KC Timber Challenge, where visitors can experience 300-foot hand-held zip lines, a “vertigo bus” and monkey bars across mud pits. “The Timber Challenge is not a timed race, so it’s a personal achievement to get it done,” said Jen Scott, marketing manager. Each season, visitors can also take on the Wild Women Timber Challenge, which features a 5K mud run and obstacle course. Meanwhile Primal, a new challenge scheduled for Aug. 26, is a wild, adults-only 5K that includes water obstacles, mud body paint and more. Several specialty zip line tours sell out up to three weeks in advance. During Zip KC’s busiest times, the Sunset Tour is a favorite. “The sun is setting and the views are amazing,” Scott said. 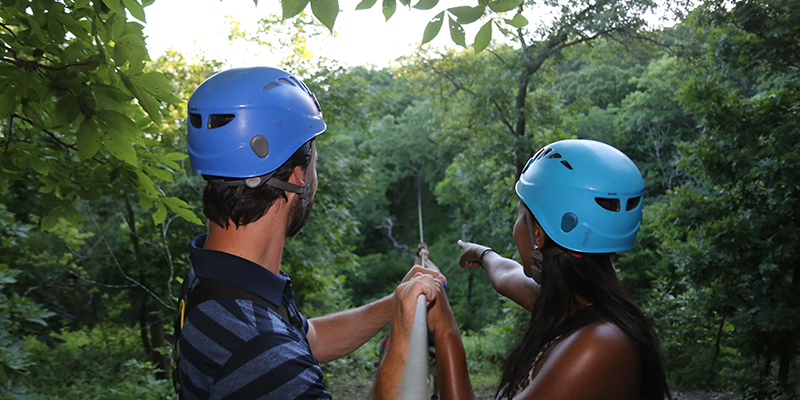 Other popular zip tours include the Hike and Zip Tour, which features a nature walk and zip lines that soar high above gorgeous Kansas River bluffs. During the Ultimate Adventure Tour, zip line activities are interspersed between short, scenic hikes, while Glow in the Dark Night Flights feature luminous necklaces and bracelets, with laser lights blazing from all towers. You can escape the summer heat too, during Beat the Heat Tower Tours, available at 8 a.m. or 8 p.m. throughout the season. Visit Zip KC Tuesday-Sunday at 12829 Loring Dr., Bonner Springs, Kan., 913-214-9478. Adults must accompany children under 18. Reservations for regular and custom tours are required 48-72 hours in advance with refunds available for cancellations more than 72 hours before a reserved tour.